The VLT Survey Telescope (VST) at ESO's Paranal Observatory in Chile has captured this richly detailed new image of the Lagoon Nebula. This giant cloud of gas and dust is creating intensely bright young stars, and is home to young stellar clusters. 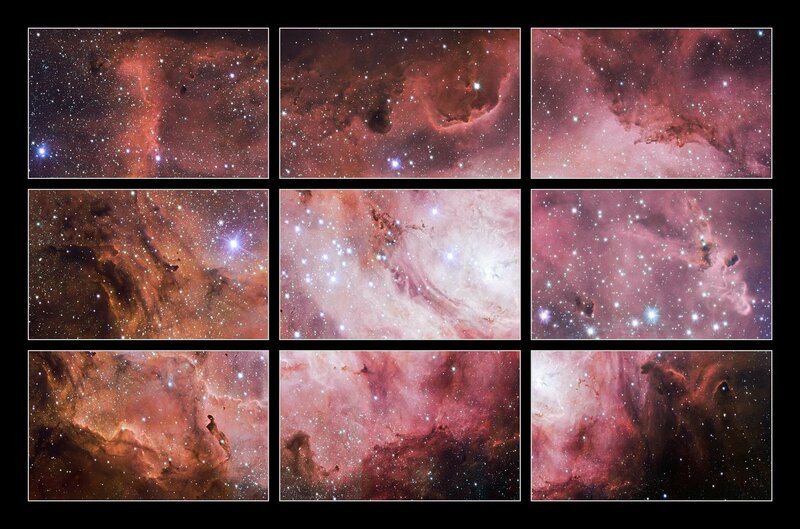 This image is a tiny part of just one of eleven public surveys of the sky now in progress using ESO telescopes. Together these are providing a vast legacy of publicly available data for the global astronomical community. The Lagoon Nebula is an intriguing object located around 5000 light-years from us in the constellation of Sagittarius (The Archer). 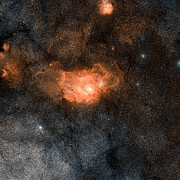 Also known as Messier 8, it is a giant cloud 100 light-years across, where new stars are forming within its plumes of gas and dust . This new 16 000-pixel-wide image is from the VLT Survey Telescope (VST), one of two dedicated survey telescopes at ESO's Paranal Observatory in northern Chile. A zoomable version of the image allows the viewers to explore the many nooks and crannies of this fascinating object. The VST was not pointed at the Lagoon deliberately, it simply was included as part of a huge imaging survey called VPHAS+ that covered a much larger region of the Milky Way. VPHAS+ is just one of three imaging surveys using visible light with the VST. 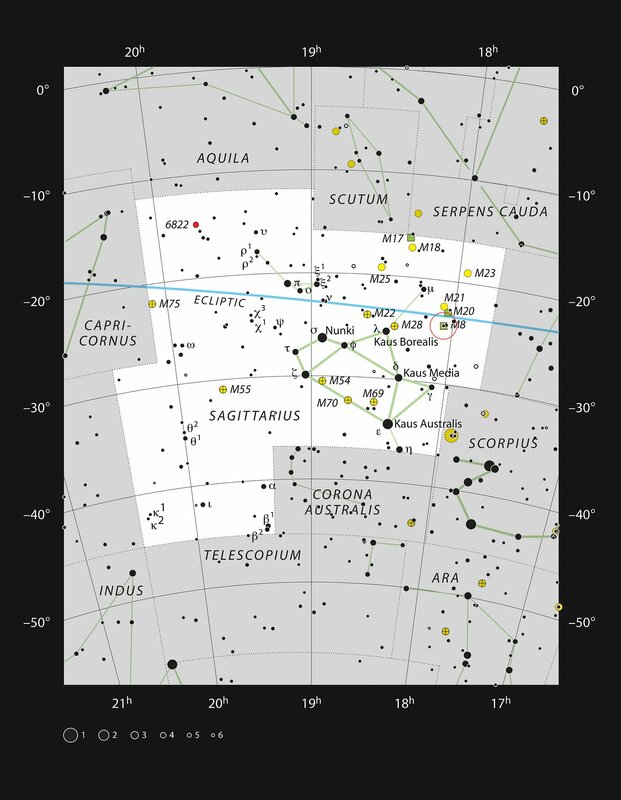 These are complemented by six infrared surveys with the VISTA survey telescope. The surveys are addressing many important questions in modern astronomy. These include the nature of dark energy, searching for brilliant quasars in the early Universe, probing the structure of the Milky Way and looking for unusual and hidden objects, studying the neighbouring Magellanic Clouds in great detail, and many other topics. History shows that surveys often find things that are unexpected and these surprises are crucial for the progress of astronomical research. As well as the nine imaging surveys with VISTA and the VST there are also two additional surveys that are in progress using other ESO telescopes. One, the Gaia-ESO Survey, is using the Very Large Telescope at Paranal to map the properties of more than 100 000 stars in the Milky Way, and another (PESSTO) is following up on transient objects such as supernovae using the New Technology Telescope at La Silla . Some of these surveys began back in 2010, and some much more recently, but data from all of them are now being made public and are accessible to astronomers around the world through ESO's archive . Although they are still in progress, the surveys are already allowing astronomers to make many discoveries. Just a few of these new results include new star clusters found in the VVV survey (eso1128, eso1141), the best map yet of the central parts of our Milky Way (eso1242, eso1339), a very deep view of the infrared sky (eso1213) and, very recently, some of the most distant quasars discovered so far (from the VISTA VIKING survey). The ESO Public Surveys will continue for many years, and their astronomical legacy value will stretch many decades into the future. ESO has produced several stunning views of this object before — most notably a huge 370-megapixel image as part of the GigaGalaxy Zoom project (eso0936) — and has also provided a completely different view from the VISTA (the Visible and Infrared Survey Telescope for Astronomy) VVV survey, which explored the Lagoon's mysteries in the infrared (eso1101). 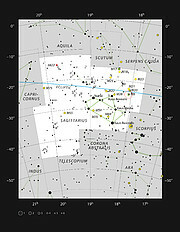 More information about all eleven surveys are available here and a comprehensive description of their current status and results is given in a dedicated section of the latest ESO Messenger. An overview of the data releases from the eleven ESO public survey projects is also available. ESO is the foremost intergovernmental astronomy organisation in Europe and the world's most productive ground-based astronomical observatory by far. It is supported by 15 countries: Austria, Belgium, Brazil, the Czech Republic, Denmark, France, Finland, Germany, Italy, the Netherlands, Portugal, Spain, Sweden, Switzerland and the United Kingdom. ESO carries out an ambitious programme focused on the design, construction and operation of powerful ground-based observing facilities enabling astronomers to make important scientific discoveries. ESO also plays a leading role in promoting and organising cooperation in astronomical research. ESO operates three unique world-class observing sites in Chile: La Silla, Paranal and Chajnantor. At Paranal, ESO operates the Very Large Telescope, the world's most advanced visible-light astronomical observatory and two survey telescopes. VISTA works in the infrared and is the world's largest survey telescope and the VLT Survey Telescope is the largest telescope designed to exclusively survey the skies in visible light. ESO is the European partner of a revolutionary astronomical telescope ALMA, the largest astronomical project in existence. ESO is currently planning the 39-metre European Extremely Large optical/near-infrared Telescope, the E-ELT, which will become “the world's biggest eye on the sky”.